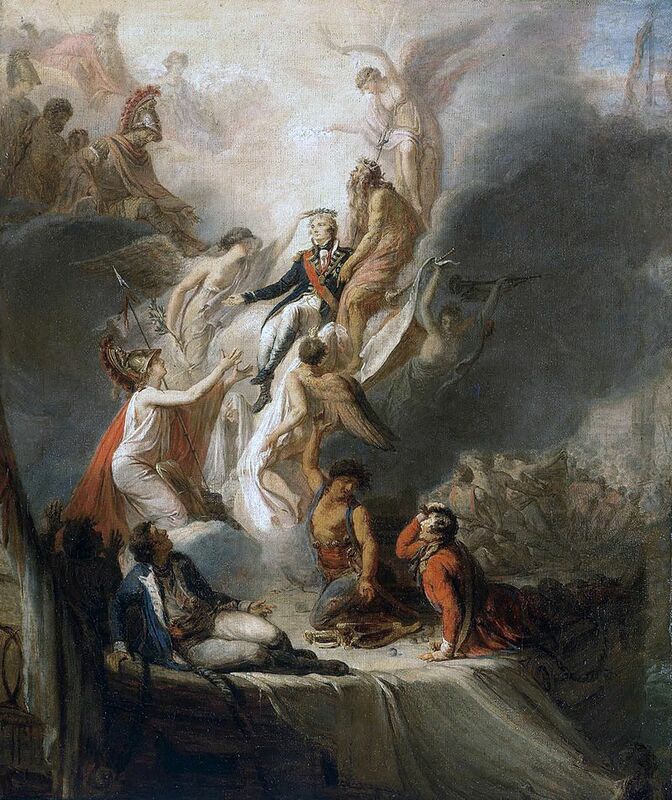 The Royal Navy’s defeat of the French and Spanish fleets at Trafalgar was the stuff of legend, in part because Lord Nelson died on the altar of victory. What followed was a paroxysm of hero worship. The flag that draped his sarcophagus had been torn to pieces by sailors craving a memento. Poems and sermons in his memory were composed and distributed through recitals and magazines. The cult of Nelson even penetrated the realm of Regency furnishings. Already present and popular among the ton, the classic, clean artistry of the Grecian style provided a perfect canvas for demonstrating hero worship. Distinctive, yet blending well with surrounding furniture, the chairs made in this mode were particularly functional, as the following print shows. The Greek influence is evident by the shape of the legs. They are carved outward, like sabres. Smaller in scale, they could easily be moved, and pressed into service for large gatherings. 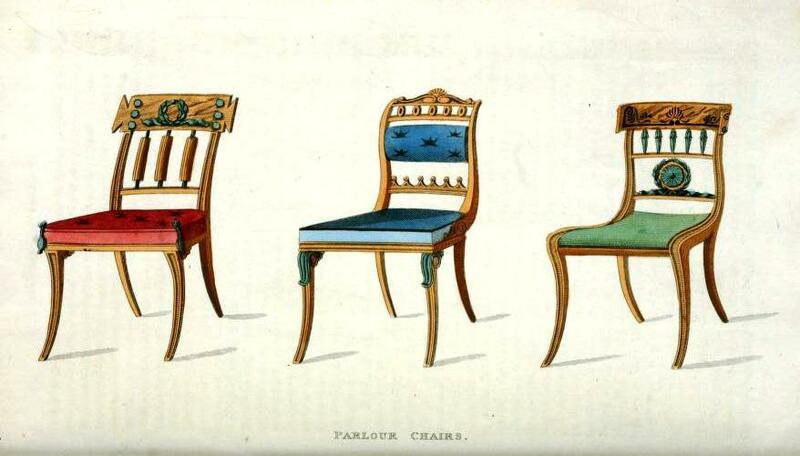 The chair on the far right is a Trafalgar–the back, seat and leg carved as if in a single stroke down to the floor. The back features a patera ornament, a symbol of reverence, surrounded by the wreath of victory. A bespoke Trafalgar would display symbolic ornamentation, demonstrating the owner’s refined taste. The Victoria and Albert Museum in London has such a chair on display, with a back carved to look like a rope that might serve as a ship’s rigging. The ebony and gilt paint make the flower-like anthemione and rope carving particularly distinctive. 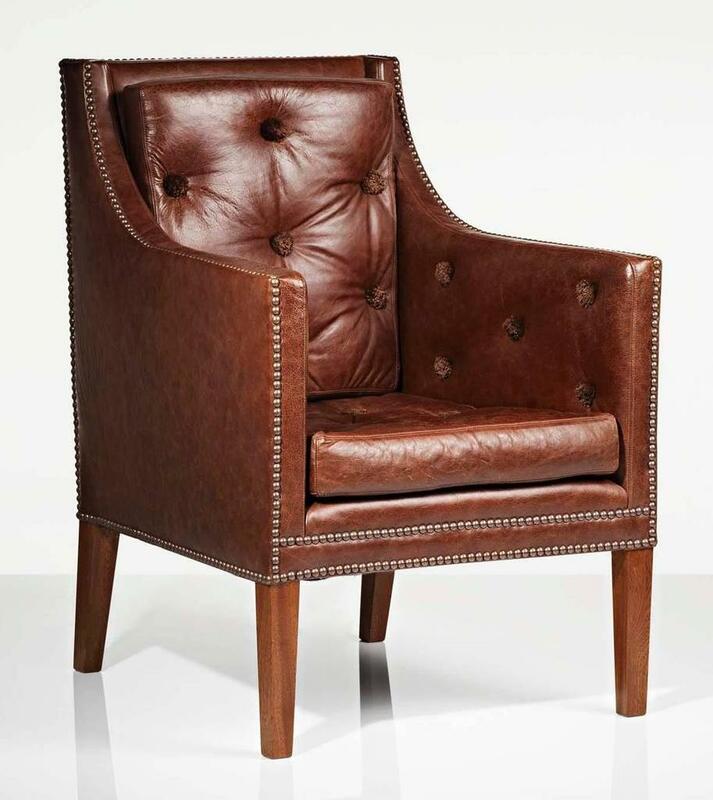 Nelson himself preferred a chair upholstered in leather, with side pouches that contained dispatches. A gift from his mistress, Lady Hamilton, it was known as the Emma, and kept in his cabin on board ship. The relic was put up for auction last year, still in its original leather upholstery. 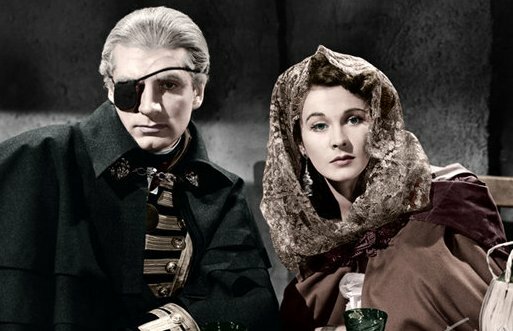 Claiming a connection to Trafalgar and its Hero, however trifling, was a mark of distinction, even if Judith’s uncle deplored it. Kit Fancot, the hero of False Colours, impersonates his older brother, Evelyn, Lord Denville, as a favor to his mama. 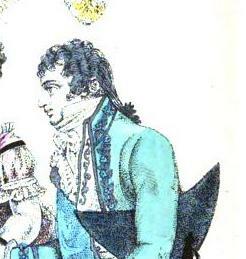 He arrives at a fancy dress party held by the relatives of Denville’s betrothed. Unfortunately, he has no clear idea of what Miss Stavely looks like. The longtailed coat was designed to set a fine figure to advantage. The tails in the back were almost an afterthought, forgotten in the evolution of the formal coat from its original function–to separate when riding a horse . What was important was the fit over the shoulders, perhaps enhanced by padding discretely inserted in strategic areas. 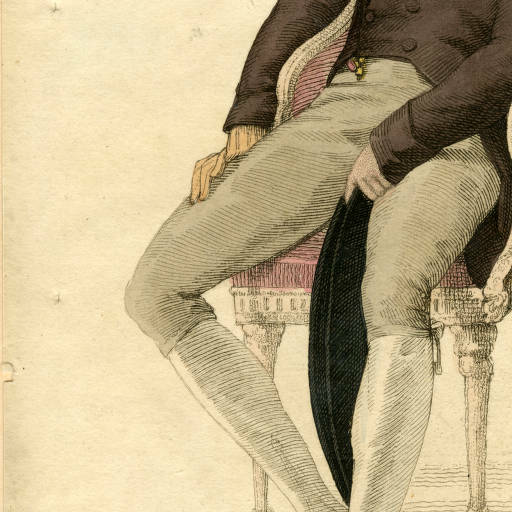 In the same way, the cutaway design revealed the upper thighs and slim (corseted, if necessary) waist of the gentleman. Knee breeches were de rigueur if one expects to be admitted to Almack’s, and thus the standard for all fancy dress parties. They were critical for Kit to pass himself off as his brother, all while meeting the approval of the venerable Dowager Lady Stavely, (grandmama to Miss Stavely). Therefore, pantaloons worn on the street would be right out in such company. Besides, the advantage of wearing knee breeches becomes immediately apparent when a well-formed man pairs them with white silk stockings. The little ties just below the knee, combined with the clinging material of the stockings, draw the eye to his shapely leg, the black slippers just the thing to command admiring attention when among one’s peers (and cross old ladies). Kit carries a hat, a three-cornered affair called the chapeau-bras. The fellow pictured above has a two-cornered (bicorn) hat. Both collapse and can easily be kept in good order by the butler or other man-servant while the wearer enjoys the party. This silver and mosaic snuff box sold for almost $3000 recently. It was made in London, 1815. Sometimes it just makes sense to honeymoon close to home. Kate and Wills went no farther than Anglesey. Vivien, my heroine of Welsh descent in Notorious Vow, would approve. There is much to be said for the privacy afforded by a windswept island off the coast of her family’s native homeland. 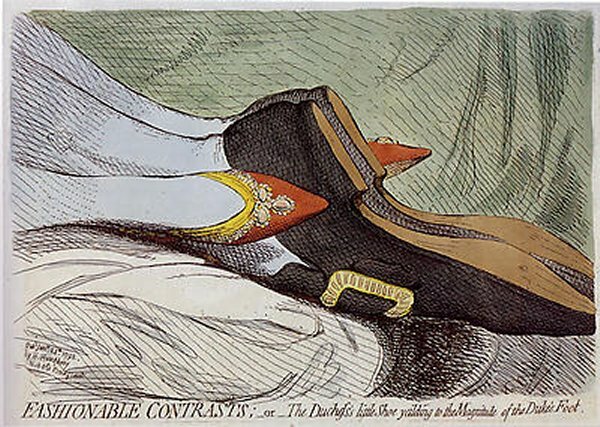 Entitled "Fashionable Contrast," this 1792 cartoon of TRHs' relationship was less than accurate. Princess Charlotte and Prince Leopold honeymooned just outside London in Weybridge, at her uncle’s estate of Oatlands. The manor had been the site of a royal palace built for Queen Anne of Cleves by Henry VIII, long since demolished. A house remaining on the estate was enlarged and eventually leased by Prince Frederick, the Duke of York. This burned down and a Gothic mansion was erected in its place and became the primary residence of his wife, Princess Frederica Charlotte of Prussia. 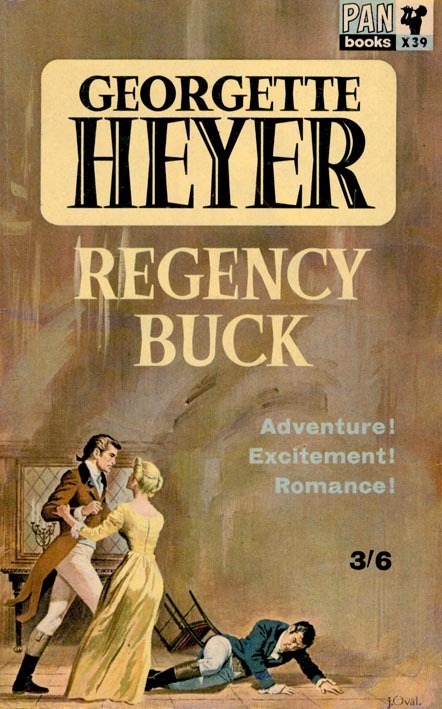 Their honeymoon must have seemed as remote to the young couple as Wales. Today, Oatlands is a hotel. You can even have a wedding there!